Probably the most important part of updating your web presence and marketing your site is the ability to measure the results of your new work. Therefore it is necessary to learn how to set up Google Analytics in order to track the visitors to your website. There is no point in putting money into advertising if you can not track your website visitors and where they came from. The same is true for creating a social media presence for your agency – you want to know what is working… right? 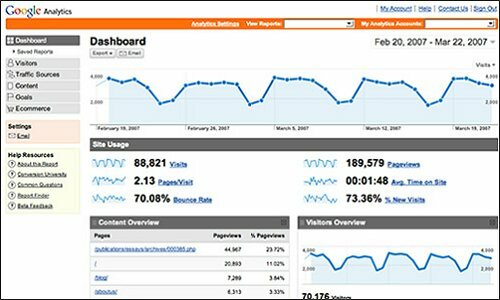 A great FREE site for tracking these statistics and probably the most popular, which is relatively easy to set up, is Google Analytics. It shows you how people found your site, how they explored it, and how you can enhance their user experience. With this information, you can improve your website return on investment, increase visitors to customers and increase your revenue. So if you have set up a new business Facebook account, invested in some online advertising or put a blog together; through Google Analytics you can see where your visitors found your site, what they viewed and even what page they exited your site on. So rather than putting a whole blog together informing you how to set this up, I’m sharing an invaluable link with you – this internet marketing company have put this great blog together on setting up Google Analytics so you can track your website visitors easily. If you do not have access to the back end of your website you may need your web developer and publisher to insert this into your site. It will take no longer than an hour for a professional, so make sure they do not look to charge you an arm and a leg! It will be well worth learning how to track your website visitors over time, you will gather data about your web traffic that will help you devise better business strategy. Try it! If you have any questions please feel free to ask andreas@rentview.com I would love to help you. Having met with lots of different agencies over the last couple of months it appears that most, if not all agencies, are looking to expand and build their property portfolio for lettings and management. So how can your agency increase its property portfolio? If you think about it, your website is like your international shop window. It could therefore gain you a lot of business. Equally, by not investing time effort (and some money) in a website, you are losing out on potential custom. After all, in today’s economic climate, landlords are increasingly based all around the world and these accidental landlords who may have initially rented the property prior to emigrating may now need assistance letting a property and/or managing one. New non-resident landlords are the customer most agencies are currently focusing their advertising towards. The non-resident landlord is most likely to take your full property management package and with property management software like Rentview, you are fully equipped to offer your landlords the ultimate management package. Over the next few blog posts, I will take you through how to do all of this in some very easy to follow steps. All of these elements should help you to increase your property portfolio by harnessing the power of the web.